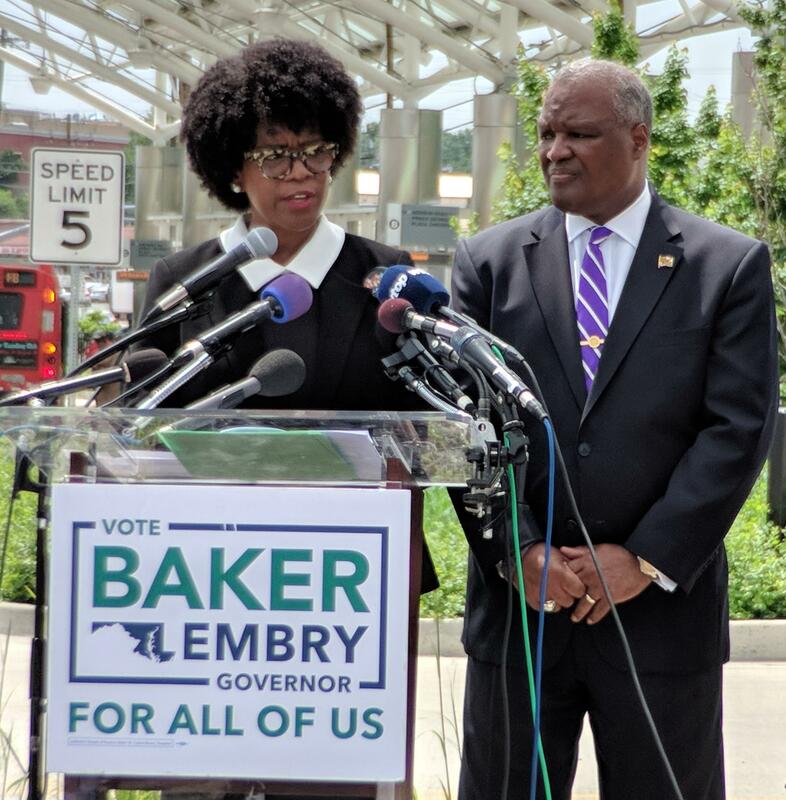 Former Montgomery County Council Member Valerie Ervin (left) drops out of the running for the Democratic nominee for governor and endorses Prince George's County Executive Rushern Baker (right). Former Montgomery County Council Member Valerie Ervin is dropping out of the governor’s race and endorsing Prince George’s County Executive Rushern Baker, she announced Wednesday. Ervin initially entered the race as Baltimore County Executive Kevin Kamenetz’s lieutenant governor candidate. She replaced Kamenetz at the top of the ticket after he died of a heart attack last month, but last week she lost her fight to replace his name on the ballot as the gubernatorial candidate. The State Board of Elections has said they do not have sufficient time to reprint the ballots. On paper, Ervin’s policies seem comparable to those of the more progressive candidates in the race, such as former NAACP leader Ben Jealous. But she said at a news conference Wednesday that her campaign aligns with Baker’s. She criticized Jealous, who is roughly tied with Baker in the polls. She has accused him of trying to keep her from Kamenetz’s ticket and of costing her her job with the Working Families Party. “The character that he is showing voters in Maryland is not the character of the next governor that I want to support,” she said. Early voting begins Thursday. Ervin’s name remains on the ballot as Kamenetz’s lieutenant governor candidate. On the Record has spoken with all nine Democratic gubernatiorial candidates about why they’re running, what issues they think are most important and how they would address them and what they think sets each of them apart--why voters should pick them to be the Democrats’ standard bearer against incumbent Republican Gov. Larry Hogan. Today our expert analyst and commentator is Mileah Kromer, associate professor of political science at Goucher College. She directors the Sarah T. Hughes Field politics center and is the force behind the respected Goucher Poll.